There are slightly different marginal rates for “heads of household”, but those are not relevant for this topic. The overall size of the federal government depends on how much tax revenue it can obtain. It is clear from the tax schedule above that those who earn more must generally pay more in taxes. Some activists desire to reduce the size of the government by using a tactic they call “starving the beast”. The idea is that if marginal tax rates are reduced, the government will receive less income tax revenue, and thus will ultimately force the government to reduce its budget targets. The claim is that in the long run, steadily declining revenue will require the government to reduce its spending and therefore its size. In other words, nearly all taxpayers would have more money left over from their paycheck. In what ways could this policy “starve the beast”? a) Money that would otherwise go to the government can be spent on appliances, cars, etc; the benefit accrues to selfish individuals and deprives the government of some revenue. b) Money that would otherwise go to the government can be spent on furthering one’s education; the benefit accrues to selfish individuals and deprives the government of some revenue. c) Money that would otherwise go to the government can be spent on charitable causes. The benefits accrue to the less fortunate, but deprives the government of some revenue. d) Money that would otherwise go to the government can be spent on vacations or saved for the future; either way, the benefit accrues to selfish individuals and deprives the government of some revenue. e) All of the above to varying degrees, depending on individual preferences. where P is the amount invested, r is the rate of return expressed as a decimal (8% = 0.08), n is the number of years the money is invested, and A is the value of the investment after n years. In this case, P would be the amount saved in a year. Inflation is ignored here because we are interested in the buying power, not the number of dollars. (Including inflation makes the calculation more difficult, and increases the number of dollars the investment is worth, but those dollars have less buying power). The effect of inflation does not change the general answer to this question. a) It is not worth it because “brown-bagging” is not cool, especially if one is a white-collar worker. In our image-conscious society, people think “brown-bagging” is a sign of cheapness, and appearing cheap may impede one’s chances of getting ahead. b) “Brown-bagging” over long periods of time is bad for the environment because several trees will probably have to be sacrificed to manufacture the bags, so it is not worthwhile. c) It may be worthwhile for short periods when money is tight, or if one’s workplace is far away from restaurants, but is otherwise socially degrading. d) It is not worth it; the amount accumulated will be so small that he would have been better off to enjoy buying his lunch every day. e) It is not worth it in general, for a combination of the above reasons, and possibly some others. When buying a house, many people use the services of realtors, who are licensed specialists in handling real-estate transactions. Usually they operate in “territories”, and acquire an extensive knowledge of the neighborhoods and school systems. Normally they will assist the buyers in helping them get around, and “showing” the houses for sale. Their fee for this service is normally 7% of the selling price of the house, which is paid by the seller out of the proceeds of the sale. What are the benefits of using a realtor if you are buying a house? a) The realtor provides protection for the buyer against unscrupulous sellers, since they work directly with and therefore, have a vested interest in satisfying the buyer. b) The services rendered by the realtor are paid by the seller, so whatever the realtor does is ultimately free to the buyer. c) The realtor can provide legal advice on the complexities of real-estate law and regulations governing these transactions. d) Since the realtors are licensed, the buyer can be confident that every property listed for sale is listed accurately with regard to age, conditions, known defects, and any existing liens against the property. If a married couple makes a decision about something, and the decision turns out to be wrong, which is the best method to determine who takes the responsibility for it? a) Whoever yells the loudest gets to blame the other one. b) The one who feels the least guilty about it has to take the blame. c) Neither should have to take responsibility for it. d) The couple should agree to blame someone else. e) The couple should discuss the situation rationally and mutually agree on who should take the responsibility. 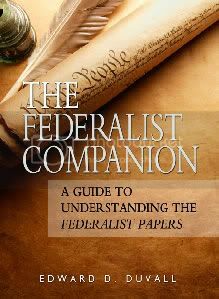 In The Federalist Companion, author Edward D. Duvall explains in detail why the Articles of Confederation failed after the Revolutionary War. The result was a union of the states under the U.S. Constitution. This book is a great aid to understanding the defense of the Constitution presented by Hamilton, Madison, and Jay in The Federalist Papers. 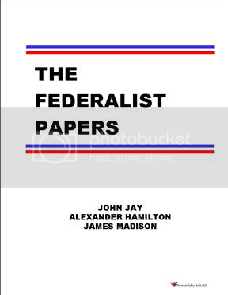 -Full version of the Federalist Papers. 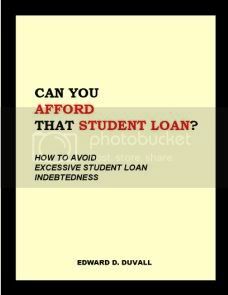 In Can You Afford That Student Loan, author Edward Duvall explains how to evaluate whether a student loan makes sense economically. It includes a unique nomographic system for seeing the whole picture of debt, income, and repayment.